Commonly known as artillery or “arty” for short, the SPG is a truly unique vehicle class in World of Tanks, and a significant number of World of Tanks fans play them. Coming a long way in their development, SPGs have found their place among existing vehicles starting of as pronounced "damage dealers" that evolved into support machines. Now’s the time to tell you how we want to change their stun parameters based on a long study of statistics and your feedback we’ve accumulated since 2017. Those of you who played World of Tanks before Update 0.9.18 will remember the significant damage that artillery could cause, thanks to their high alpha. Shells struck you suddenly, and you didn’t have the opportunity to avoid them. This situation concerned the overwhelming majority of vehicles, no matter the armour thickness. After Update 0.9.18, gameplay for SPGs changed and artillery became a more command-oriented class. The focus when playing SPGs changed from dealing high damage to a specific target to causing damage to a wider number of vehicles. The artillery began to pay more attention to the map sectors, where there were a lot of enemy tanks and where the allies most needed help. Long stun time when under fire from several SPGs. Currently every new stun works independently from the previous one. As a result, players who find themselves under fire from several SPGs can get a massive extension of the stun effect, which is not limited in any way. Such a situation is especially inconvenient for heavies and other slow machines: due to the constant stuns, they are forced to stand still with reduced characteristics and remain inactive. As a result, these machines become an easy target for adversaries. The mechanics of getting a long stun even without taking damage. 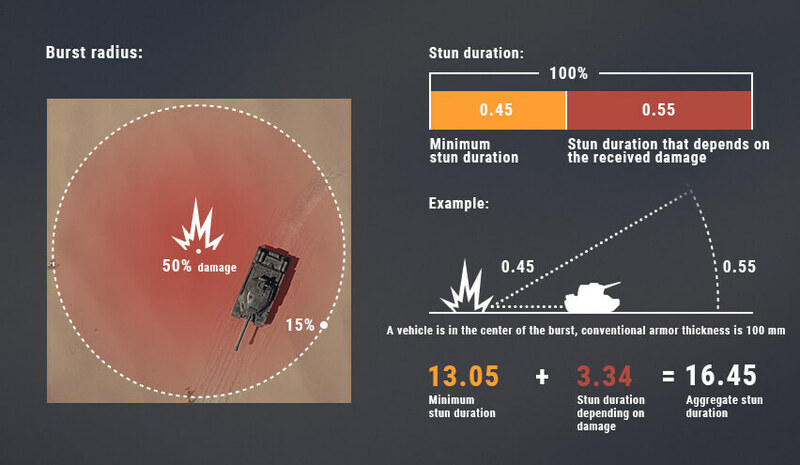 In situations where the SPG shell falls far from a tank and causes minimal damage, there comes a stun time, which in any case reduces the performance characteristics, regardless of the amount of the inflicted damage. We want to change this situation. The most significant changes for the upcoming rebalance of artillery affect stun mechanics. Our main goal is to reduce the total stun time, especially after being hit by several SPGs in a row. The first stun is 20 seconds. After 8 seconds, another shell hits your vehicle, adding another 23 seconds. And the total time will be 8 + 23 = 31 seconds. 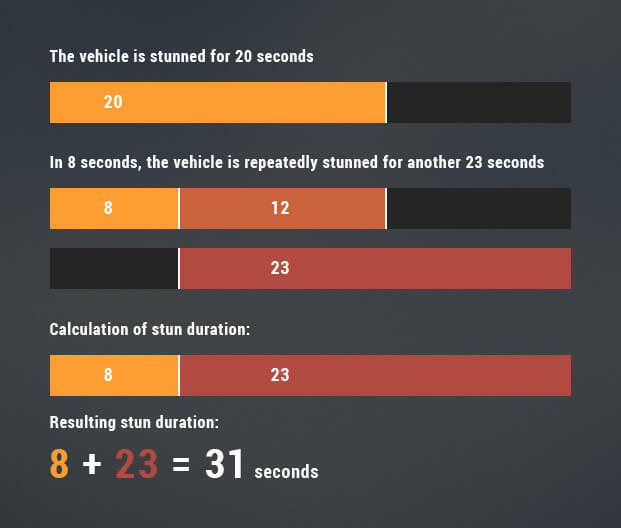 The first stun is 20 seconds. After 8 seconds, another shell hits your vehicle, adding another 23 seconds. 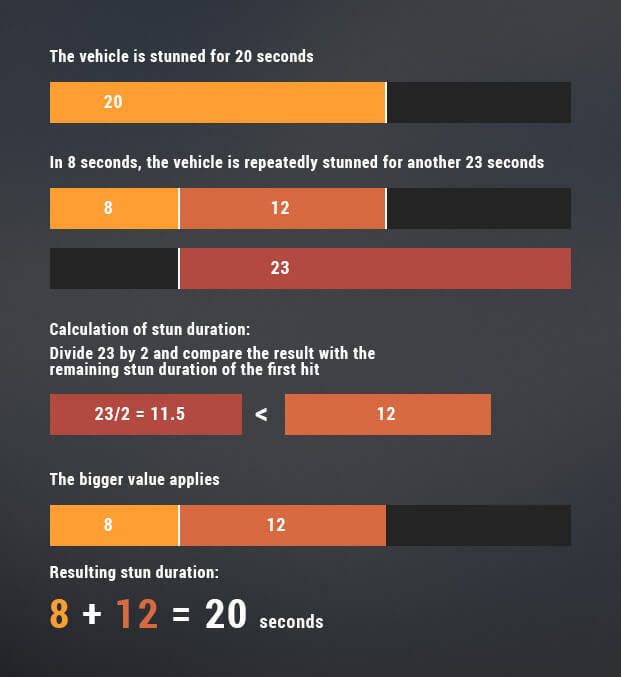 It is then halved, so the total stun time is 8 + 12= 20 seconds. As you can see, the difference between 31 and 20 seconds is significant. During this time, you can change your position, deal damage to opponents, reset the base capture, etc. Thanks to the new mechanic, the stun time from the repeated hit of a SPG will be greatly reduced. There will also be more cases in which the stun timer will not change at all when you are additionally stunned.